***** As the nights grow longer, the autumn always feels the perfect time for a new horror story, so I was looking forward to being in the audience for SUTCo’s new play Monster, written and directed by the company’s member James Huxtable, who was responsible for writing another of my favourite new plays of the year so far. Monster introduces the audience to Annie and Martin, a married couple who live in a remote house, far away from the busyness of the town and the people, where they have lived for many years. However, any chance they have at happiness is being impeded by the monstrous beast they are harbouring in their basement. When one day Martin injures himself, and needs to be cared for by a vigilant nurse, the audience discover if they can keep the dark secret under wraps, especially as the monster wants to get out, and doesn’t plan on staying hidden forever. Monster continues to showcase James Huxtable’s extraordinary talent as both a writer and director and in decades to come I firmly believe that audiences will go out of their way to see his work and I can’t wait to see what James turns his pen to next. A master of tension, suspense, emotion and beautifully engaging storytelling James play had the entire audience enthralled from the moment they entered the theatre to the cast already on stage, before drawing them deeper and deeper into the characters disturbed lives. James writes with an emotional level, life experience of someone decades older than him and his directing skills bring this and the very best out of the cast he works with. Ultimately a play about secrets, lies and their terrifying consequences, Monster featuring incredible performances from all of the cast, especially the three couples, with the play seamlessly moving between their stories as their lives devastating unwind, leaving the audience desperate to discover how they and their actions link together. Emily Bowles superbly portrayed Annie decades beyond on her age, both in terms of look and body language, broken by unknown life experiences that you would not impose on anyone. Opposite her, Jack Hewitt as Martin captured the essence of a reclusive man just fighting to survive and some how get through the nightmare he has found himself in; whilst Jack Merriman and Lorna Dale as the Boy and Girl sweetly captured the childhood innocent, knowing and outlook of life and childhood friendship. However my best performances of the night came from Jake Bastable as Lamb and Lucy Bytheway as Angel, who shared incredible chemistry and captured both the joy of love in a young marriage and the emotions and strains on a relationship that anyone who has ever been desperate for a child or has made the smallest mistake will emphasis with, before their lives roll out of control. Harriet Barker as Edwards and Matthew Bevan as the optimistic Winston not only added some light relief at first to this dark tale, and you would definitely want Winston as your nurse if you ever needed home care, but also emphasised how your lives and actions can affect those you come into contact with. Matthew also got to show off his clock fixing and dancing skills from his performance earlier this year. The Shadows, performed by Raina Palit, Liz Hawksworth and Eleri Stevenson, were not just a means of changing props and scenes but were haunting dark, almost ballet like in their movements, guaranteeing to make anyone not trust what is lurking in the shadows. With a slight nod to a certain Inside No. 9 episode, Monster builds up to an intense, shockingly terrifying twisted ending that whilst explaining a lot will also stay in the audiences minds for a long time and mean that we can never listen to Velvet Underground or Lou Reed’s “Perfect Day” in the same way again. Monster continues to showcase SUTCo at their very best and should not be missed by fans of exciting new theatre and tense drama; and like all the greatest horror films in history, proves the disturbing power of the gradual build up, unseen unrecognisable noises, red lights, loud ticking clocks, shadows and why you should never live somewhere with a basement. 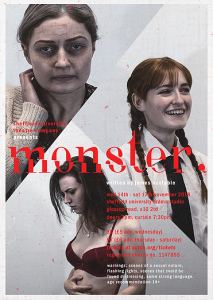 Monster will be performed at Sheffield University Drama Studio until Saturday 17 November at 7.30pm. Tickets are £6 in advance and £7 on the door. To book visit www.sutco.org/tickets. The award winning SUTCo perform four shows a semester. There final show of this semester is 7.62 from Wednesday 28 November to Saturday 1 December at DINA. For further information and to book visit www.sutco.org. P.S. Please note that Monster contains distressing scenes, scenes of a sexual nature, themes of mental health, scenes of domestic violence, flashing lights and strong language and has an age recommendation of 14+.